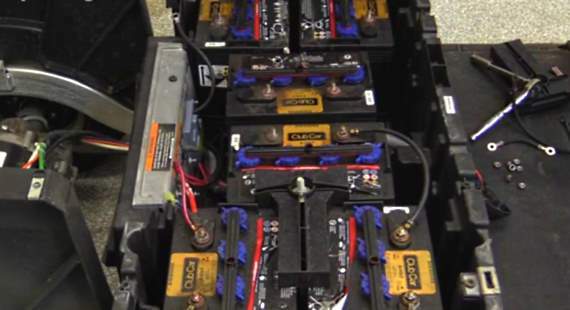 Would you like to know how to properly replace your batteries in a 48 volt Club Car Precedent electric golf cart? 8 volt golf cart batteries are very heavy and require proper safety measures for installation. This video explains the exchange of 8 volt batteries in a newer Club Car Precedent. Make sure to take off your jewelry, wear gloves, have proper eye protection, and use extreme caution when swapping batteries out. Quality Lead acid batteries typically last 3-6 years and require monthly maintenance to insure maximum life. Distilled water is always recommended and try not to over fill. My 48 volt (six 8 volt batteries) wouldn’t run after the winter despite y running the charger several times during the winter. I found that many of the cables and posts were corroded so I cleaned them all. I saw how it was necessary to get a charge into each battery in order for the 48 volt charger to recognize to turn on. I used my 12 volt car charger for about 30 minutes on each battery but when I plugged in the 48 volt charger I could hear it humming but the needle simply jiggled around a bit at the 0 level on the meter. I checked that I had put the cables back on properly with Positive on one battery to Negative on the nee next and so on. Also found horn won’t sound and buzzer doesn’t work when put in reverse. With nothing happening can you offer any suggestions. Wonder if I need to charge each battery more than 30 minutes. Pretty befuddled so hope I can get help. Bruno: Most likely one of your batteries is completely damaged and will nor recover. Test each one by one to check and replace.